While Michael is the historian and the linguist in the family, I am the astronomer. When I was asked, as a child, what I wanted to be when I grew up, my answer was “an astronomer”. After high school, I had the idea that I should learn a bit more about what it really meant to practice astronomy, so I wrote to the Kitt Peak Observatory in Arizona – one of the top facilities in the US – and volunteered to work there for the summer helping out any way needed. I received a polite reply explaining that there were a very large number of PhD candidates and even post-docs who had already made the same offer and my services would not be needed. So I ended up not becoming a professional astronomer, but I do still have in a closet my attempt at hand-grinding my own mirror, and thanks to a glorious 40th birthday present from Cynthia a decade ago of an 8” Schmidt-Cassegrain scope, I have been able to pursue the interest on an occasional dark night. With this modest background, I can truly appreciate what a wonderful resource a facility like the Kuffner Sternwarte is – for the contributions to science that it made in its original time, and today for the city of Vienna, both as a living piece of scientific history and as a working telescope available to people who simply love to look deep into space and dream about what is out there. Klaudia and Gunther were kind enough to have us up to the dome last night, and I can tell you from first-hand experience, it’s spectacular. But today we are here to recognize, not the plaque on the inside which celebrates the facility itself, but this new plaque on the outside, which commemorates its creator Moriz Kuffner in the context of the crimes later committed against him and his family. 1938 was a tragic year for Moriz, as for many others. It started with the death of his wife Elsa, followed a month later by the sudden death of his son Ignaz, who was Michael’s and my grandfather. Then just one month later, Ignaz’s wife – our grandmother – and our mother fled together to Switzerland on the eve on the Anschluss. Our grandmother told us the story that at the train station, they informed the Austrian guard that they were just going to visit grandma’s parents in Basel, as they did regularly. The guard, seeing the name on their documents, asked if they were the Kuffners of the Ottakringer Brewery, and grandma had to decide whether to say yes or no, thinking that if she said yes, the guard might be less likely to let pass a member of such a prominent family. In the moment, she said yes, and the guard, after a pause, replied “Good beer” and let them go. Moriz and his surviving sons Stefan and Hans remained in Vienna until later in 1938 to try to salvage what they could of their business interests, art, and real estate, negotiating as best they could and with limited success with the Gestapo. Then, finally, they too fled to Switzerland in what sounds like a Mission Impossible plot line, going by way of Czechoslovakia where a small airplane took them across the border with the help of Moriz’s Swiss climbing associates. They settled in Zurich. By that point Moriz was quite sick, and he died in March of 1939. And now I’ll digress from Moriz for a moment to tie Michael and me in to the story. Our mother and grandmother stayed a year with their family in Basel, but as it seemed more and more possible that Germany would invade Switzerland, the family decided to send grandma and mom to England, and from there they went on to New York, arriving in 1940, where the two of them began a new life. In 1964 she married our father, whose family had fled Germany in 1936. Shortly after, they bought the home they lived in together for 49 years. I arrived that year, and Michael just a year later. And so mom lived an American life from age 11 until she died, just a month after our father, 3 years ago, and Michael and I grew up as American as anyone we knew. Though German was both our parents’ first tongue, in the family they used it only as their secret way of communicating and never advocated that Michael and I should learn it. Michael chose later to learn it in school, and I never did. Given what happened to her childhood, Mom’s ambivalence, often hostility, to everything related to her Austrian past, is understandable. People react differently. Mom chose separation. So while mom was alive, Michael and I pretty much accepted her statements that her Viennese past was not a very interesting subject, or at least not one to be explored. But after she died three years ago, Michael and I began to realize how much we didn’t know about our Kuffner ancestors, and that set us on a trail that has brought us to you here today. As a consequence of mom’s reticence and also the young age at which she fled Vienna, I have not much family lore nor many personal anecdotes to share with you about Moriz. But I will relate a couple stories that we remember mom telling us. In general, the picture she painted of Moriz was of a loving but very impatient man. For example, every day at noon, when he crossed the road from the brewery to his home for lunch, the family would watch for him out the window, as they had to be ready to sit the moment he sat. No one was allowed to eat until he started, and the moment he was done, everyone’s food would be taken away. My mom was always a fast eater, and she attributed that to her early training at her grandfather’s table. Another story: Moriz once brought mom to a toy store and her told she could have any one item she wanted in the store - but she had exactly 3 minutes and not a moment longer to make the choice. But I regret many questions we have about Moriz will not be answered. One set of questions in particular I have after spending last night upstairs under the dome is about his relationship to this observatory. Why did he choose astronomy as the particular science he wanted to support? Did he wait eagerly for reports of new discoveries? Did he spend late nights here with his own eye pressed against the eyepiece? What did he think about what he saw? As his world fell apart in 1938, did he find comfort in understanding how tiny we are in the bigger scheme of things, or did he feel, as Nietzsche said, the abyss staring back at him? 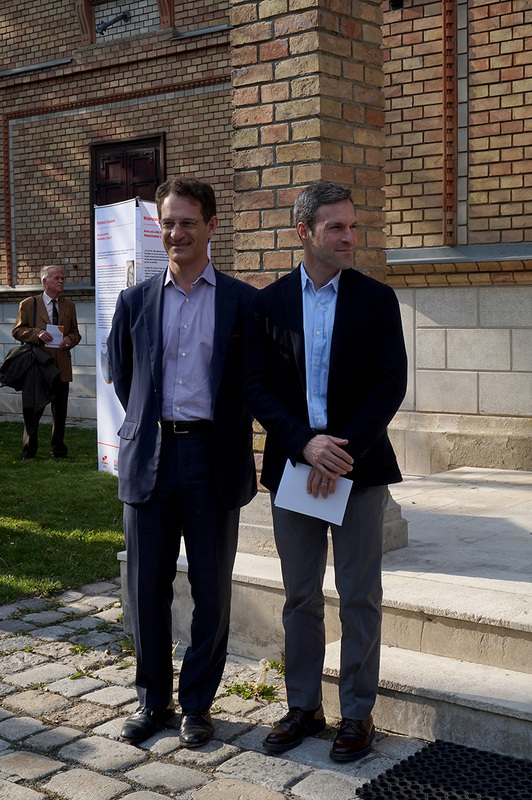 Before I introduce my brother Michael, let me close by say that we applaud the City of Vienna for placing this plaque here, for celebrating the contributions that Moriz Kuffner made to this city, and for remembering the WHOLE history. Ich glaube dass ich diese ganze Rede auf Deutsch halten konnte, aber ich weiss auch dass ich zu viele Fehler machen wurde und es wurde mich sehr verlegen machen. Trotzdem, ich hatte es gern aus zwei Grunden versucht zu tun. Erstens, weil ich uben muss. Zweitens, weil mein Bruder kein Deutsch kann. I am enormously thankful to Klaudia and Gunther and everyone at the Friends of the Observatory. They have kept the Observatory going for decades. They have done a tremendous amount of research into the lives of Moriz von Kuffner and the Kuffner family. And, they have recognized here today with this plaque the rightful place that Moriz von Kuffner holds in the history of astronomy and the history of Vienna. Some of you may know the author Ray Bradbury for his novel Fahrenheit 451 – about firemen who burn books. He was also a great short story writer. One of these is titled Sound of Thunder. It’s science fiction. In the future, there is a company that takes hunters back in time to shoot dinosaurs. The company selects dinosaurs that are right about to die anyway, because the company knows that to alter the past is to change the future. At the beginning of the story – in the present -, there has recently been a political election. At first reading, the election doesn’t seem so important. The hunting party goes back in time and kills their dinosaur. Unfortunately, one of the hunters steps off the path they were supposed to be walking on and crushes an insect. They return to the present where it turns out that a different candidate won the election – all because of a chain of events set off through the death of an insect. The story resonates today with our current American President. Couple dead bugs and maybe we could have had Hillary instead of this maniac. Not to mention that we are in a house of science where there are no alternative facts – just facts. No fake news – just the well-established firmament. I also think about the story in terms of what happened to the Kuffners and by extension the Jews of Vienna and by extension the Jews of Europe. One looks back into the past and searches – hopelessly of course – for some way to change that uniquely massive theft and murder that we call the Holocaust. In our own lives – pipe dreams or not - we would like to think that there must be solutions to our problems. That we can fix our careers or our families or our bodies. But, the past cannot be fixed. It cannot be altered. The Final Solution was, in fact, the final solution. What we can do, however, is to understand the past fully and honestly. To consider the roles and motivations of the Dramatis Personae – the cast of characters - with the exacting, revelatory clarity of an accountant’s calculator or a chemist’s scale or an astronomer’s telescope. To read the past – as if still in school underlining passages and writing in the margins to get beyond the basic plot. To consume the story so fully so that it can be repeated to others and the tale can live on. When I think back to the past of Moriz von Kuffner, my immediate reaction is how I pale in comparison. He was a fantastic entrepreneur. Serious benefactor of the arts, religious life, and science. Socially and politically modern and progressive. Great family. Prominent mountaineer. That last one in particular hits home. He climbed so many 4,000 meter peaks while I barely get half so high. How could anyone look at Moriz von Kuffner and not think: “Any society would be fortunate to have Moriz von Kuffner in its midst. Any society would, in fact, fight to keep Moriz von Kuffner from setting up shop somewhere else.” Besides the brewery, he and his family owned an amazing amount of property throughout Vienna. He wasn’t thinking just about his own life in Vienna. He was thinking of generations of Kuffners to come who would continue to live and thrive here. Every aspect of his life suggested an intimate, unbreakable bond with this City. He must have assumed reciprocal feelings in return. No fool, he would have appreciated the Anti-Semitism of Dreyfus to the West (reported on by Vienna’s very own Theodor Herzl) and the pogroms to the East and even perhaps the road map laid out by a fellow Austrian from Linz in Mein Kampf to the North, but not here. Not now. At most, clouds on the horizon that would soon dissipate. Moriz must have felt untouchable like Joseph in his coat of many colors with each color representing an element of stability and safety: his own father ennobled, his son in the Austrian army, the brewery, the properties, the relationships, the social standing, the philanthropy, the observatory, the decades in Vienna – all of those colored patches held together with the thread of incredulity that anything dangerous could possibly happen. He could never have imagined that those colored patches would soon be reduced to a single, yellow star. With the rise of Nazism in Germany and Austria, to quote Robert Burns: “The best laid plans of mice and men oft to gang agly.” Think of what a shock that must have been to Moriz and the Kuffner family to realize it was all a fraud. That everything they had created not only counted for nothing, but made them even more of a target. Shock is probably the wrong word. More like those videos of the melting ice cap in Greenland. Chunk after chunk of ice disappearing into the ocean. Chunk after chunk of belief that somehow this wasn’t actually happening and it would actually turn out okay disappearing until, in the end, reality was laid bare. He was not beloved. He was hated. He was not a great man immune to abuse because of status. He was just another Jew ripe for the picking. Now, it was time to leave, and quick; there was something far worse in store for him. Eichmann – another fellow Austrian – was on the cobble stone streets looking for something to do. It wasn’t a fair fight: the barbarity and coarseness of Nazism versus this highly cultured man. But, there was a clear winner. I am a great follower of sports. The most important question is always “who won?” We might read about the match and which player did what or what the manager could have done differently, but, the score is what matters. If one considers the Kuffner family pre and post the Anschluss in terms of lives lost, wealth lost, history lost, future lost, the answer is clear: the Nazis won and the Kuffners lost. There is a temptation – again temptation - to say “at least”. “At least” Moriz, his two sons Hans and Stephan, his daughter-in-law Helene, and his granddaughter Vera all made it out. “At least” the Kuffner Observatory still exists. All of which is true and had those things not happened, George and I would not have been born and we all would not be here today to celebrate – yes, celebrate – the rebirth, in a sense, of this Observatory. But, the bottom line is there are no happy Holocaust stories – which often end, appropriately, with the admonition – “Never forget”. For me, an often-overlooked part of “never forget” is an appreciation for the original sin: to “never forget” that none of this ever should have happened in the first place. Just as with Ray Bradbury’s short story, we all live now in a world that should be very different indeed. Let me close where I started. With thanks and gratitude – to the Friends of the Observatory and to everyone who took the time to be here today. Finally, in the spirit of honesty, I must admit that I could never have written this speech in German. And, even with that first bit, I asked a german-speaking friend to check for errors. Thank you.